I was a stranger and you welcomed me." The Connection Cafe is a free lunch program for homeless and low income individuals and families in downtown Des Moines, Iowa. We serve lunch at noon, every Monday-Friday to our honored guests. 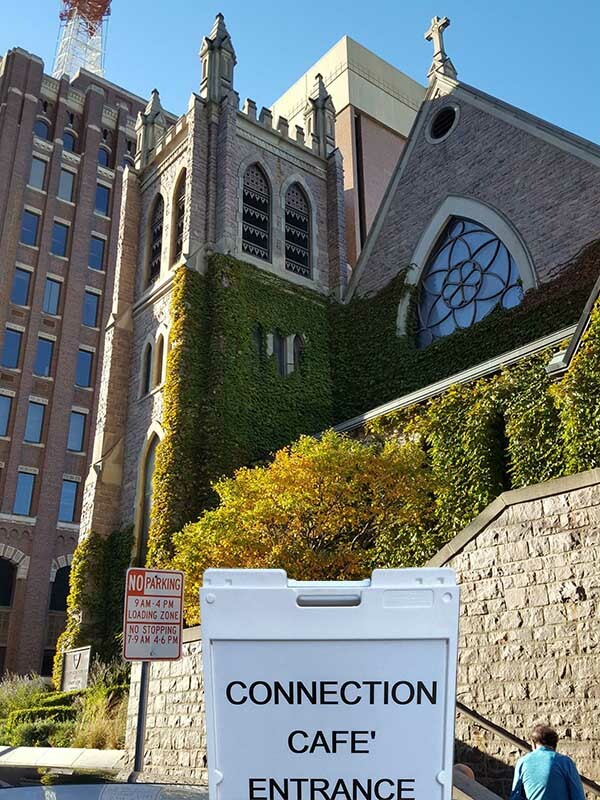 We operate under the auspices of The Bridge, a 501 c 3 non-profit, ecumenical organization that is comprised of four downtown churches: St. John's Lutheran Church, St. Ambrose Catholic Cathedral, First United Methodist, and the Cathedral Church of St. Paul Episcopal. We rely on the generosity of volunteer groups who provide the food, prepare it and help serve lunch to over 100 guests 5 days a week. The program provides the venue, a small kitchen, and table service.